Owning inherited property can be a struggle. Owning that same property with other people may be even more of a hassle. If you have recently received a portion of property through inheritance, gift, or purchase and you don’t want to own the property with others, here are five things you can do. Selling your interest in the inherited property is a common solution to the problem of owning real property with others. Let’s say you have just inherited a 50% ownership in your late mother’s home. The other 50% share is owned by your sibling. If you are not interested in owning the property, but your sibling is, you can offer to sell your interest to that sibling. Alternatively, you may be able to sell your interest to an outside party. This may be difficult though. Not too many buyers are interested in owning a portion of property. And if you are having such a difficult time owning the land with others, outside parties may not want to take on the challenge either. Maybe you would like to keep the property you have inherited with your sibling(s). You can offer to buy the inherited property interest of the other owners to gain full ownership of the property. In order to purchase, both parties (you and the sibling who is selling their interest) must agree to the sale and the terms of such sale. 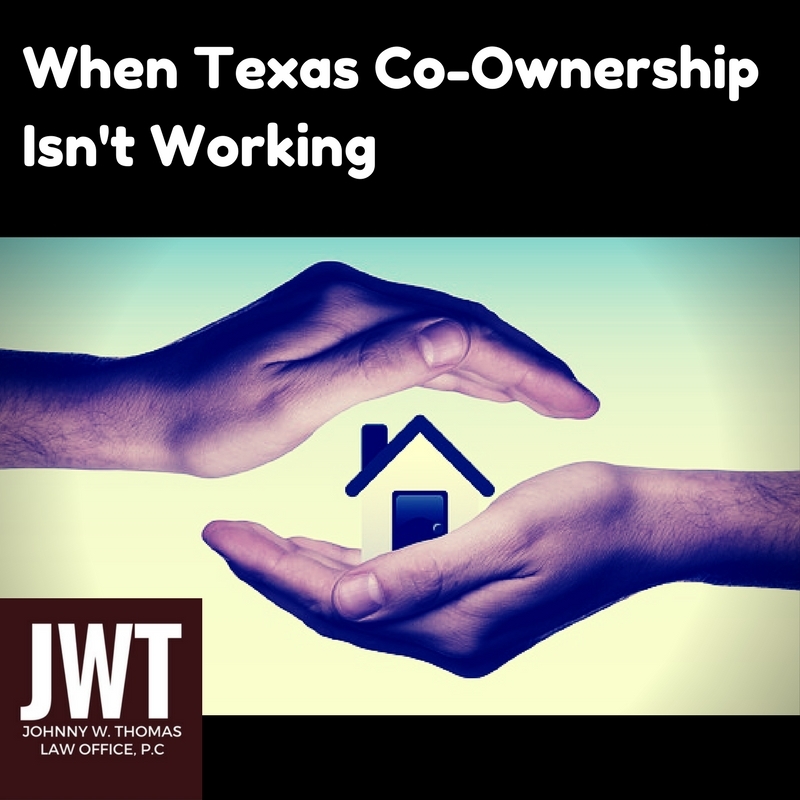 This may be the easiest solution to co-ownership problems and usually works when the inherited property is not worth much and there is one owner who wants to keep the land. Instead of the hassle of selling and purchasing interest, each co-owner can give their portion of their land to one person, creating full ownership. If the co-owners are in total disagreement about what to do with the land, a co-owner may file a suit for partition of the property. A partition petition will ask a judge to divide the property and distributing each co-owner their respective share. If the land can easily be divided physically into separate tracts, a partition in kind may be granted. For example, if four siblings file a partition to divide a four-acre piece of land, the property is likely to be physically divided and each sibling will be granted one-acre of land. If the land cannot be divided into separate land, then a judicially-ordered sale of the property may be granted, the property will be sold, and each co-owner will receive their respective portion of the sale proceeds, minus any fees and expenses paid. You may decide not to take any action regarding the property. Beware! The problem with doing nothing usually means the consequences may show later down the line. Many clients come in with family property where no legal action has been taken for years asking the attorney to “sort out ownership” and clear title for sale of the property. This process tends to be very expensive and time-consuming to achieve the wanted result. Additionally, doing nothing, including failing to pay property taxes, may lead to a tax lawsuit with foreclosure. It is best to speak with an attorney regarding your rights, responsibilities, and possible outcomes for not taking legal actions. Property transferring can be tricky business. Costly mistakes can easily be made when legal documents are not properly drafted. Whichever option you choose, it is best to speak with an attorney to protect your interests.